First off, an apology — the past couple of weeks have been unusually hectic for members of the SNOWstorm team. Mike Lanzone and Trish Miller were in Israel for the Champions of the Flyway birding competition (which raised money this year for African vulture conservation). Steve Huy and his wife had a baby; I moved from Pennsylvania to New England. Dave Brinker has been zipping between conferences from Edmonton to New York. A busy time, and we’re sorry the updates have been sparse. The big news came last night, though, when Stella got back in touch for the first time since the end of November. You’ll recall that this female owl, tagged in January 2018 on Amherst Island, Ontario, as a juvenile, checked in for the first time last Nov. 15 from central Saskatchewan. Her backlogged data unspooled her spring and summer travels into the northwest Canadian Arctic, then straight south to the prairies. 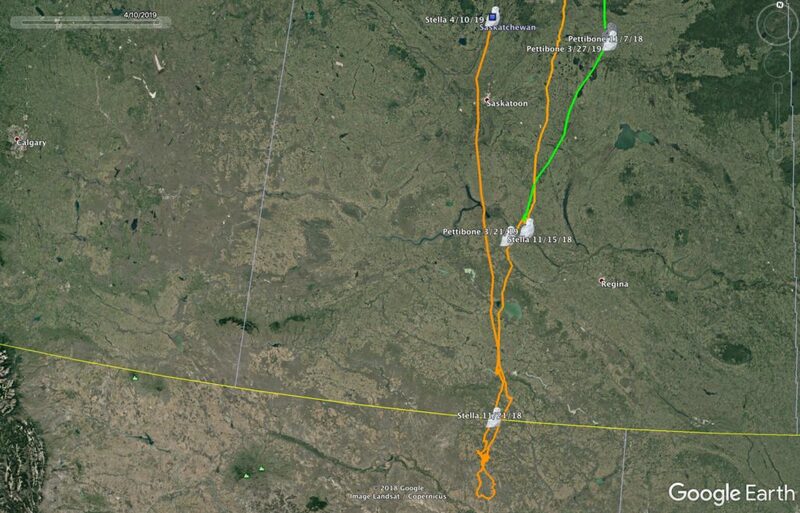 Stella kept moving south, and on Nov. 21 she was just a few kilometers from the Montana border. And then — nothing. For months. We wondered, obviously, whether something bad had happened, either to her or to her transmitter. But Andy McGann at CTT pointed out that northeastern Montana is one of the biggest dead zones for cellular coverage in the U.S. Maybe she’s just out of range, Andy suggested. Still, as spring approached and many of the other owls started moving north, we knew we were down to the wire. Would Stella reemerge? Wednesday night (April 10) she did, in spectacular fashion, checking in from central Saskatchewan while sprinting north at a rapid pace. 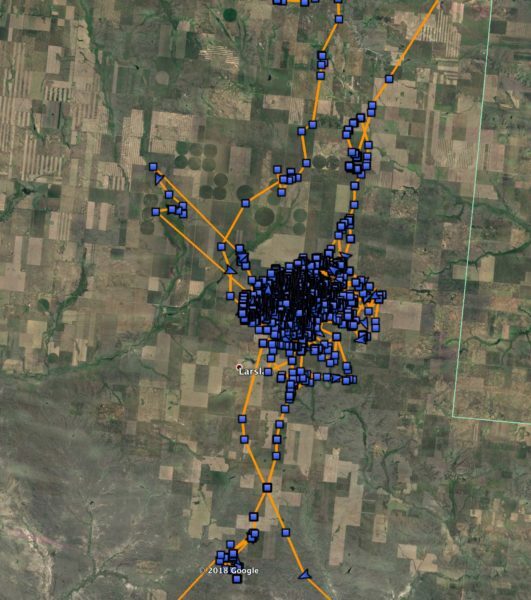 Her transmitter uploaded more than 6,600 GPS points from the past nearly five months, showing that she had indeed spent the winter in a fairly small (15 square mile/37 square km) territory in northeastern Valley County, MT, about 26 miles (42 km) south of the Canadian border. On April 7 she started moving north, spending a couple of days at Fife Lake near Lisieux in southern Saskatchewan, then the night of April 9-10 made a 425-km (264-mile) sprint right up the middle of the province, stopping for the day near Leask, SK, near the northern edge of the prairies. That’s where she was when she phoned home. Good thing she connected when she did, because the cellular network gets pretty thin north of there, once the land transitions into boreal forest. We may not get another transmission from her once she crosses that threshold, though we’re always hopeful an owl will be near a bush village with cell service on a check-in day. But it’s great to know what she’s been up to all winter. There’s lots going on with the rest of the crew, too. Working our way west to east, Pettibone is still hanging out near Melfort, SK, which was his stopover spot on his trip south last November. Woodworth has moved back south from extreme southwestern Manitoba into Bottineau County, North Dakota, southwest of the Turtle Mountain plateau — the same general, 50-mile (78-km) swath of prairie and ag land he’s used all winter. To his east, Argus last checked in April 2 from Walsh County, North Dakota, east of Grafton along the Red River of the North, having moved up from southwestern Minnesota at the end of March. Plainfield gave us a scare. On April 1, her transmitter checked in but its voltage was tanking because the unit itself was running at breakneck speed, doing almost continuously operations it should have been doing only periodically. The folks at CTT suspected a bug in some new software we’d uploaded to her, and sent fresh instructions — but to receive them, she’d need to be in cell range and have enough residual power to connect. Problem was, Plainfield was already in northern Minnesota, heading into an region with few cell towers, and we worried her battery might already have flat-lined. Might we lose her for good? Instead, we got lucky. She checked in April 9 near Kashabowie, ON, about 35 km (22 miles) north of the Minnesota border, took up the new program and her transmitter settled down nicely. We also learned that she’d flown more than 350 km (220 miles) north into western Ontario, then for some reason backtracked southeast again most of that distance. It’s empty country, but she found a cell signal. Seneca, who at one point was a relatively short distance from Lake Huron, has moved east the entire length of Lake Erie, and is on the rapidly shrinking area of ice off Point Abino, Ontario, about 18 km (11 miles) west of Buffalo. 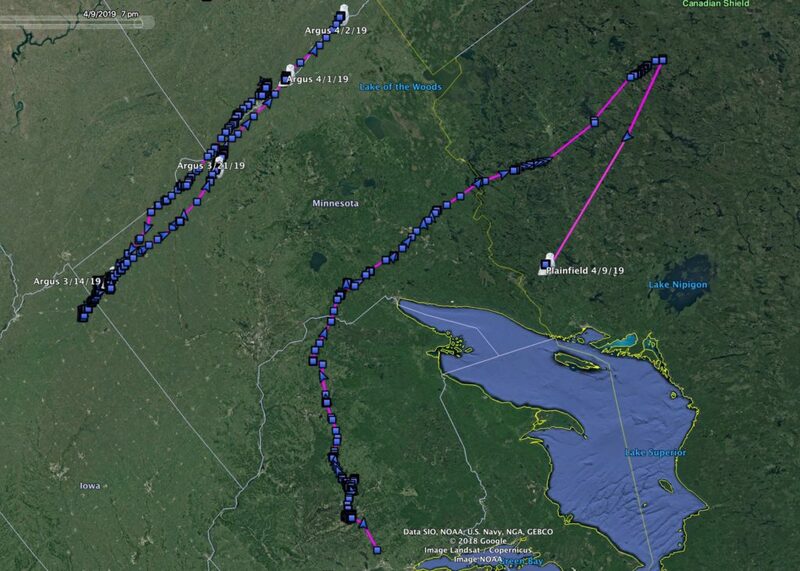 Otter likewise made a big loop last week, leaving the entrance to the St. Lawrence near Cape Vincent, NY, and flying east of Ottawa and into southern Quebec on April 3 before reversing course all the way back to his starting point. This kind of not-quite-ready-to-migrate restlessness isn’t uncommon at this time of year. On his little ramble, Otter went right through the area west of Ottawa where Hardscrabble has been hunting since the end of March when he did a loop-the-loop to the south and came back to the Ottawa River valley. It’s been a few days since Hardscrabble checked in, though, and he may already have started north for good. Island Beach is drifting north from the Richileu River valley near Montreal, where he spent the winter, and April 10 was near Berthierville, QC, on the north shore of the St. Lawrence. Farther downriver, Wells has for the first time in months moved off the waterfront and urban freeways of Quebec City and out onto the river near île d’Orléans. Finally, Pickford remains on Prince Edward Island, finally having run out of sea ice on which to ride — she was on land at Murray Harbour on April 10. So thrilled to hear that Stella is in contact again. Wonderful to hear that Stella is doing well. Such an interesting read. Hope she visits her “home town” next winter. Also thrilled to hear from Stella again! We saw her several times on our visits to Amherst Island. Good to hear Plainfield’s unit is back to normal. Thanks for the updates Scott!! Welcome Baby Huy and welcome to Massachusetts Scott!